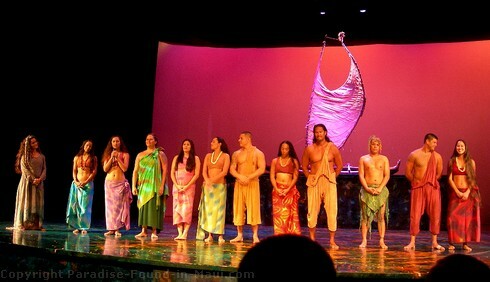 The Maui Theater's colourful stage production of Ulalena is absolutely spectacular and the perfect alternative to a luau if you want to be entertained by the rich myths and history of the islands! But don't just take my word for it - it's also received high praise from The New York Times, Conde Nast Traveler, National Geographic and many others. You can't help but lose yourself in Ulalena's colourful web of stories about Maui's spirit beings, the creation of the islands, the voyagers like Captain Cook who came to the islands, and the brave Polynesians who met them. The live music is incredible and dances through the air - nose flutes, drums and more - accompanied by the chants and songs of the performers. You feel it in your bones - it's truly amazing! 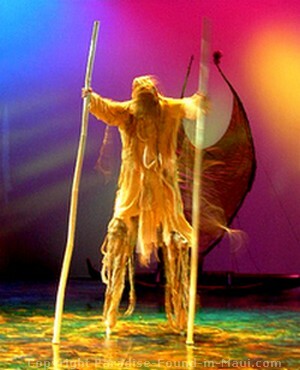 The elements of Butoh theater combine with traditional hula, modern dance and impressive acrobatic feats to tell these stories of the Hawaiians, from their own point of view. If you're looking for a dash of Hawaiian culture on your next trip to Maui, but want something that's totally different from a luau, I really think you ought to give this a try. Tip: Be sure to read the program before the show starts so you'll know what's going on during the performance - some people find the show hard to understand if they don't do this. Should I go to Ulalena or a luau? Many people ask if they should go to Ulalena or a luau. If you've read much of this site, you'll know that I absolutely adore a good luau. If you've got your heart set on an authentic luau experience, complete with entertainment and traditional foods under the stars, then I recommend you go to a luau. But, if you've already been a few and want a change of pace, or if you're worried about the weather interfering with outdoor luau plans, then the indoor stage performance of Ulalena is a perfect choice. You'll be told the stories of the ancient Hawaiians in a fresh, new way that's very different from what you'll see at a luau. And if you can't decide between the the two, and you've got the budget for it, I'm sure you'd be very happy if you went to both! On a recent trip we did just that and we thoroughly enjoyed the experience. If you like, you can even purchase a dinner package to go along with your VIP tickets - options at the time of this writing include dinner from the Lahaina Grill, Ruth Chris' Steakhouse, Lahaina Fish Company and the Hard Rock Cafe. When we were here for a November showtime, pretty much everyone got to sit in the best seats because most of the seating went unsold. Those who purchased less expensive seats further back got to move up front for free to any vacant seats. If you have your heart set on VIP seats, then I recommend you cough up the cash and pay for it. But if it wouldn't be the end of the world to you if you had to sit further back, it might be worth chancing it and just waiting for showtime to see if you'll be lucky and get to move up to a better seat at showtime for free. Tip: When you get to the Barefoot Tours site, you'll see a drop-down menu on your left under Maui. Select "Theater and Shows on Maui." Next, scroll down a bit until you see "Maui Theater." Select that, and you'll see all of your ticket options for Ulalena. If you're driving north past Lahaina on the Honoapiilani Highway, make a left turn onto Papalaua Street at a set of lights. (You'll also see a gas station on your left hand side at the intersection.) You'll be driving towards the ocean now, and will pass the lighted intersection with Wainee Street. After that, you'll see Lahaina Center and a Hilo Hatties store on your right. Across the street from that is a sign for Old Lahaina Center. You'll see a strip mall there with lots of free parking. You'll find the Maui Theater and Ulalena here.